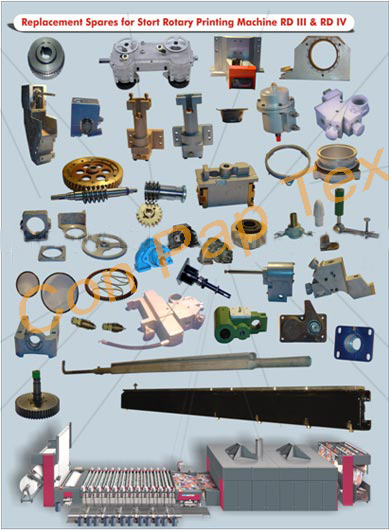 We are leading manufacturer, exporter and supplier of Spares For Stormac Stork Rotary Printing Machine Parts with international standard from last 25 years from India. Spares for Rotary Screen Printing Machine Like Printing Unit Lifting Bevel Box, Hand Wheel, Screen drive Gear Shaft, Screen Drive gear, Fork Assembly, Muff Coupling, Eccentric Type, Bearing, Rollers MS etc. Also, we are leading manufacturer of Rubber Roller, Rubber Fillet, Slitter Rewinding Machine, Web Guiding System and more. 1. End Rings (Die Moulded Aluminium screen end ring) of all repeats. 10. Screen Head- Drive Side 64 cms. 14. Colour pump. SB-4, SB-5.